Classy Gear - Gear We Like: August 2010 | It's not your tech, it's how you use it. For this month’s Classy Gear, I wanted to highlight a few things that are worth considering as you’re headed back to school or back to class if you’re headed back to the classroom. Even if you’re not, I also wanted to focus on a few things that can help you remain a constant student, or at least get into the back to school spirit, even if you’re just heading to the office again like any other day. Whether you’re a student heading off to college for the first time or you’re looking for a way to spruce up your cubicle for the fall, there are a few geeky and classy ways you can bring a little life and personality to your living or working space, especially if you have to have them combined. Let’s dive in after the jump. The Amazon Kindle 3 is Amazon’s most recent version of the wildly popular Kindle e-book reader, and has been highly praised as the best yet. The new Kindle brings a smaller form factor to the device without sacrificing screen size, and makes the device lighter, thinner, more portable, and now even smaller than their competition and smaller than previous Kindles. It’s still available in both Wi-Fi only or Wi-Fi + 3G versions for book downloading from the Amazon store on the go, regardless of where you are, and uses a gorgeous e-ink display that’s low-power and low-drain on the battery and also high contrast so it’s easy on your eyes when reading a novel, even in direct sunlight. The new Kindle is, quite bluntly, the best stand-alone cheap oakley sunglasses dedicated e-book reader in the market, and the web capabilities it does have are pretty solid for what you would expect to do on a device like this. Amazon boasts that the battery will last about a month with regular use, long enough between charges to read reams of blogs, books, and do some book and magazine downloading without having to rush for the charger, and definitely long enough to use the device however you want while you’re traveling without making sure you have it plugged in at night. Whether you’re headed back to school and you’re looking for a great way to get digital copies of your textbooks instead of lugging paper copies around, or you just like to read and you want a way to keep your books on a single device instead of on shelves upon shelves, the newest version of the Kindle is a great way to get in on e-books, especially if you haven’t tried an e-reader yet. 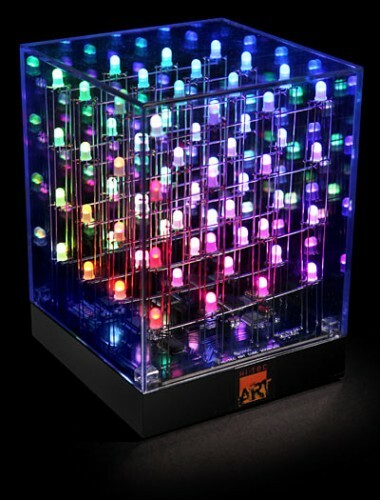 from ThinkGeek is a little on the pricey side, but if you’re willing to pay for it you’ll have a desk toy that’s incredible to watch when you’re trying to get a little work done (if you wouldn’t get too distracted by it) or when you’re idly surfing the Web or gaming. For a hundred bucks, you get a dynamic desk accessory that will keep you entertained whether you’re using the computer or not, and when you aren’t, it serves as a nice relaxing light effect in Foakleys your space. Perfect for dorm rooms and home offices alike. I saw these guys at CES in Las Vegas, and they were selling the stuff from a booth on the show floor. I didn’t want any at the time, but thought it would be great to have, especially after seeing a demonstration of exactly how effective it is. Thanks to ThinkGeek, you can order the Cyber Clean Electronics Cleaning Putty anytime you want, in any quantity you choose, and say goodbye to dusty and dirty keyboards, mice, and other peripherals forever. Personally, I have a brush or two that I use to dust out debris and crumbs or anything else that may get in my keyboard on a regular basis, but it’s not perfect by any stretch and frequently just pushes the dust around in between the keys of my keyboard, or in the grooves of the plastic molding of my mouse. With Electronics Putty, you can actually get the putty down into those grooves, and it’s just tacky enough to pull up loose dirt and dust without sticking itself to your electronics or getting caught in those spaces. Just press it down in between your keys, wait a second, and peel it up – complete with all of the dirt and grime that’s been accumulating between your keys. Then just wash the stuff off, put it back in its tub, and let it dry for the next use. 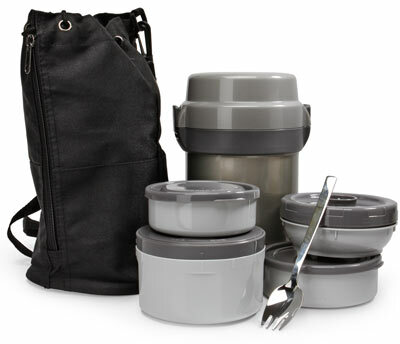 If you have a day full of classes and you know you won’t have a chance to hit a dining hall or cafe until they’re all closed, or if you’re headed off to work and want to brown-bag it instead of spending money on lunch at a restaurant or fast food, the Mr. Bento Stainless Lunch Jar Set is perfect for you. The set comes with four microwave-safe plastic bowls and a stainless steel carrying container that fits them all, even when all four bowls are loaded down with food. The set also comes with a nylon carrying bag so it’s easy to transport. Perhaps best of all, the entire set comes with an eating spork! Not only do you get a set of bowls to carry your food, but you get an eating utensil to use when it’s lunchtime. The bowls have seal-able tops, so you can fill them with soups and stews; you don’t have to use it for snack foods and solid items only. The containers are even cheap oakleys insulated, so if you’re traveling with a bowl of hot soup and you don’t have access to a microwave, you can trust that it’ll stay hot at least for a few hours. Regardless of whether you just want some snacks to get you through a long day of classes, or you’re the type who doesn’t get to leave their desk at the office for lunch because they’re so busy (like me,) you can appreciate these. One of the quirks about living with a roommate or living with roommates in general is that you need a good way to communicate with them and leave them notes occassionally when you know you may not cross paths. If you’re headed back to campus, or you’re sharing space with roomies, or if you just want a way to leave yourself a note or two before you forget something, the Boogie Board LCD Tablet from ThinkGeek is perfect, re-usable, and won’t get dingy or dirty the way that chalkboards and whiteboards do. The Boogie Board is completely paperless, and while it comes with a stylus, you can also write on it using your finger, a stiff brush, a stylus from another peripheral, or just about anything else that’s gentle enough to activate the pressure-sensitive screen on the Boogie Board. The pressure sensitive surface also lets you press harder for thicker lines and softer for finer points. Perhaps best of all, when you’re tired of what’s displayed on the Boogie Board, or you’ve done everything on your list, or bought everything on the shopping list, one touch of the button at the top will wipe the slate clean and ready for you to use again, good as new! That’s it for this month’s Classy Gear segment! Not a lot of high-end gadgets and gear this time around but instead some useful gadgets and gear that won’t break the bank but will help you make a cozier home office, dorm room, or just a cozier office for those of us who aren’t headed back to class but want to reward ourselves with something shiny as if we were. As always, let me know what you think of the products in the round-up this month, and leave a comment if there are any products you’d like to see included in a future Classy Gear segment. Have you had an opportunity for a hands-on test of the Boogie Board LCD tablet? Reviews I've found are mixed, The major complaint seems to be about screen contrast; users report the images are not as bright or clear as the promotional photos suggest. Some reviews also indicate that the quality of the lines is not as smooth as shown in the manufacturer's illustrations. Apparently the product was released early this year at $29.99, but the price has since increased substantially. The best prices I can find as of mid-September 2010 run from $35.00 (plus shipping) to $39.75 (free shipping). Higher prices range to near $60.00. Even at $40.00, and with an estimated lifespan of three or four years (the manufacturer claims six years), the high cost of dry erase markers and the inconvenience and mess of cleaning fluid and paper towels makes this device seem like it would offer a potential replacement for individual white boards for classroom use. I suspect children would love this device as an alternative to "scratch paper" when solving math problems, for handwriting practice, and as an entertaining pastime during weather-necessitated "indoor recess." It's difficult to calculate the "green factor" when considering an item like this. What is the "paper equivalent" of manufacturing a plastic device with circuit boards, batteries, and, from what I understand, a substantial amount of cardboard and plastic packaging material? Factor in a limited lifespan, and the "green-ness" of a device like this becomes questionable. 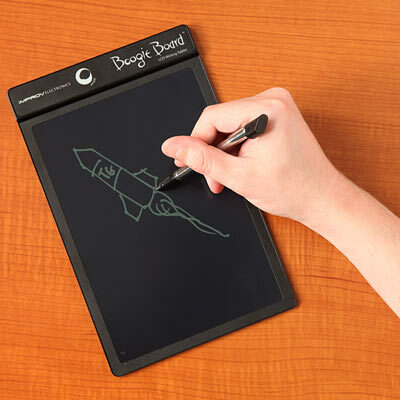 I'd be interested in seeing an in-depth, hands-on, personalized review of the Boogie Board LCD tablet. Are equivalent devices available from other manufacturers? @Davidd: Thanks for the comment! No, I can't say I've had the opportunity to get hands-on with the Boogie Board for very long, but I do very much like the idea, especially for roommies and people who are sharing the same space, including kids! 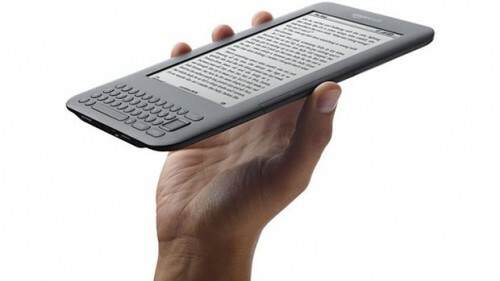 I think a hands-on would definitely be warranted if I can get my hands on one! I'll reach out to the manufacturer and see what I can find out, and worst case scenario may pick one up for my own use!